The New LIZA Enigma comes in an Aluminium casing. It’s advanced roller mechanism uses a unique bullet-lock system, heavy-duty spring, high index plastic covers and aluminium barrel to ensure trouble free performance. The LIZA Enigma can be easily installed onto the wall/ceiling or with standard LAV Wall brackets. Having trouble getting your Projector Screen fixed up, we can do it for you! Get your screen installed in a wide variety of venues, including homes, houses of worship, conference centers, classroom facilities, Offices, and many other businesses. 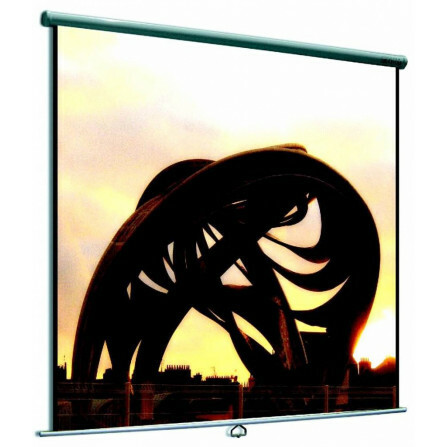 Mounting procedure of manual projector screen onto concrete wall or ceiling as per specifications. For Ceiling mounting : Height from floor to ceiling cannot exceed 4m. Low cost screen and easy to use. Simple to install on the wall. Great service from company staff too.